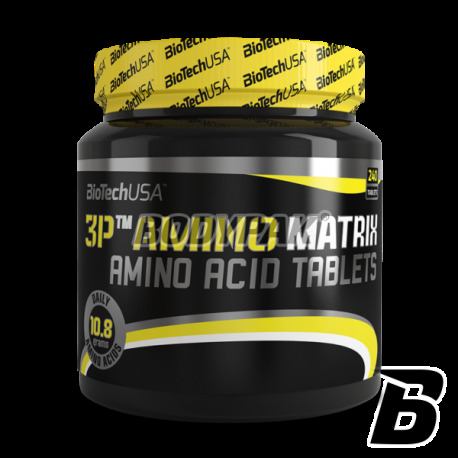 Amino AcidsBioTech 3P Amino Matrix - 240 tabl. BioTech 3P Amino Matrix - 240 tabl. This clinically tested Speciality acid product containing large amounts of arginine and lysine. This optimum combination of amino acids allows the maintenance of weight during the diet and prevents breakdown of muscle tissue. This clinically tested Speciality acid product containing large amounts of arginine and lysine. This optimum combination of amino acids allows the maintenance of weight during the diet and prevents breakdown of muscle tissue. It contributes to muscle regeneration, as well as the development and maintenance of lean muscle mass. It's time for a change. It is time for real research and innovation. Thinking about a new product, we wanted to not only create something better than other products. We decided to shake the foundations of the entire supplement industry. We decided to give athletes a real breakthrough innovation that changes the rules of building muscle. "When I started using 3P Amino Matrix ™, I was so excited. The ability to influence the product development on this scale does not happen every day. And then came the results, I lost 6 kg of fat and won 4 kg of muscle in just a few weeks ... I never I thought the product based on amino acids is capable of that. " Anonymous tester No. 324. That's why we decided to develop a way that affects the very basis of the growth and regeneration of muscle. We decided to improve muscle building formula once and for all, creating a revolutionary product, tested on real people in the real research rather than relying only on some academic studies 80s. Going back to the basics: Amino acids are the backbone of proteins, and more importantly the foundation of muscle tissue. Without amino acids your muscles can not grow or recover from training. Every sports fan knows it. Nevertheless, many of you are aware of the fact that the amino acids used in food are simply taken from a single source of protein, regardless of their composition. In fact, most manufacturers do not care about it. "I never really believed in this study. What innovations can optionally be included in such a well-explored area, that are amino acids. However, these free conditioner convinced me to attend. Begrudge his whole life if I did not do it. This comes back to life is just perfect. no other amino acids did not work for me ever so effectively. " Anonymous tester Nr417. 3P Amino Matrix ™ is different. With 3P Amino Matrix ™ we found the perfect blend of amino acids for muscle growth and recovery post-workout. This revolutionary product contains a blend of amino acids bearing plant and animal origin, constituting a true innovation for those who take muscle building seriously. 1 serving before training. 1 serving after training. 1 portions in the morning on an empty stomach. Serving Size: 2x 4 tabl. Ingredients: 30% pea protein, 45% whey protein concentrate , Maltodextrin, stabilizer: cellulose, talc (talc, silicon dioxide, magnesium salts of fatty acids), capsule sheath (thickeners, hydroxypropylmethylcellulose, polydextrose, sodium carboxymethylcellulose, anti-caking agents (talc, potassium aluminum silicate), maltodextrin, dextrose, triglycerides Dye: scarlet, titanium dioxide, indigotine, emulsifier: soy lecithin . Do Janusza suplementacji - może po prostu masz dobrą dietę i wystarczająco się wysypiasz :).. Sam produkt 1 klasa - czuję różnicę! Dobre aminy o zróżnicowanym pochodzeniu.. cena faktycznie trochę wysoka, ale IMO warto! Cena mnie troche odrzuciła, ale za namową kolegi skusiłem się na zakup tego produktu. Mam mieszane uczucia - niby miało spowodować lepszą regeneracje, a ja nie zauważyłem różnicy. Jedynie czuje sie troche bardziej "nabity". Universal Nutrition Amino 2700 - 700 tabl. Universal amino acids for use throughout the day. 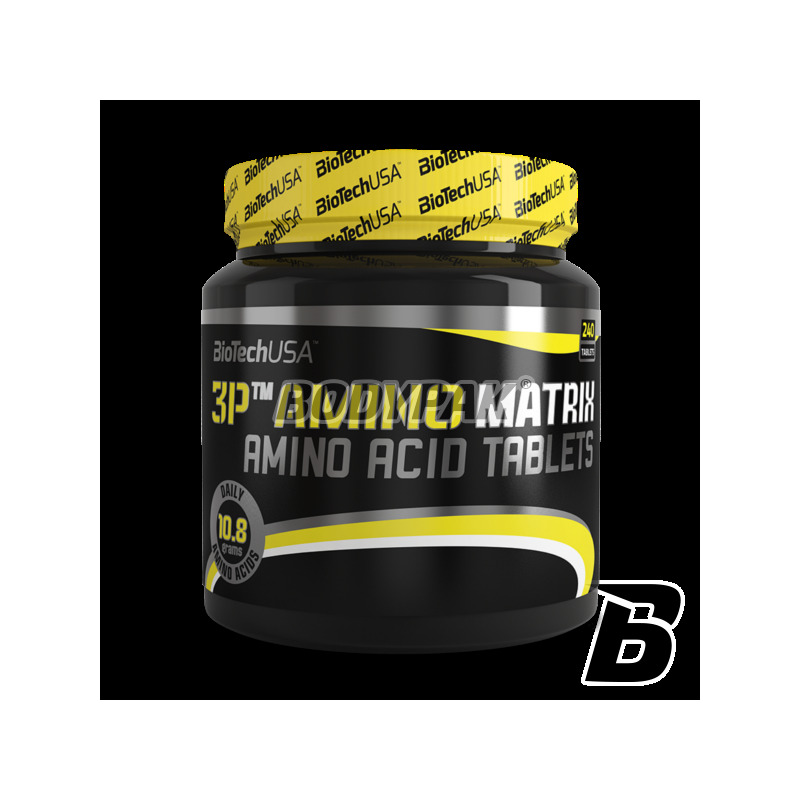 They provide a constant and steady supply of anabolic amino acids to your muscles. A high amino acid content in the tablet. Highest quality at an affordable price.